Glasgow Punter: Glasgow International 2018 - Ah, but is it art? A quick first impressions review of some of the stuff that is on at the sprawling Glasgow International art festival in the city for the next two weeks. It is an absolute pleasure to have this kind of gala appear in the city every two years, and much of it feeds off of the community of people making art in Glasgow. In the space of a few hours I battered around over 30 different exhibitions at 18 different venues on my bike, and would have kept going if I hadn't needed to get home for my daughter getting in from school, and I still felt that I had barely scratched the surface. However, it must be said that a fair amount of the stuff on show this year is high in concept, low on execution. If it takes you longer to read the accompanying blurb than it does to ponder the work itself, that's not usually a good thing. Sometimes you need no explanation, such as with the fabulous pair of mechanical (and very life-like) snails crawling around the floor of the Modern Institute's Aird Lane space. "Maybe" by Urs Fischer makes you laugh, makes you linger and is beautifully executed. Another highlight for me is found in the main space on Osborne Street of the Modern Institute, given over to the powerful post-modernist images created by Duggie Fields. Less successful are the many exhibits at House For an Art Lover, the Oxford House and Stallan-Brand Architect Office beside the Sherriff Court, and the Savings Bank on Bridge Street. However even in these places it is at least a chance to get inside these beautiful and fascinating Glasgow buildings not always open to the public. 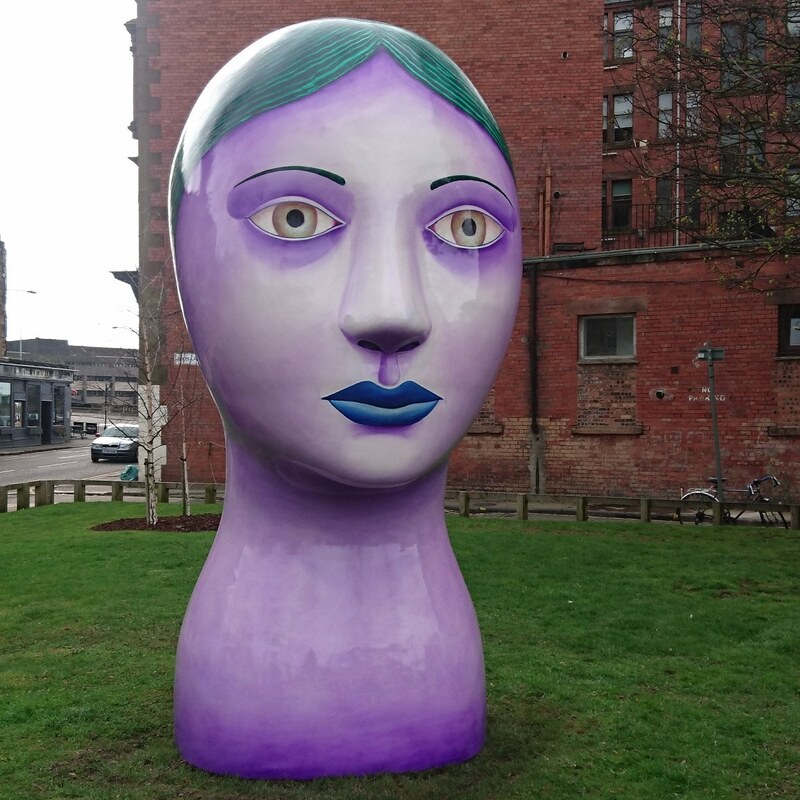 Nicolas Party's big purple head outside Aird Lane and Toby Paterson's "Pallisade" outside the old Linen Bank on High Street are colourful distractions, whilst Turner Prize winner Lubaina Himid's jolly dragon which stretches across the main hall in Kelvingrove Art Gallery looks like the kind of bland decoration you would find in a department store during some nondescript festival. More head scratching ensued when we came across the combined efforts of eight artists in the Botanic Gardens glasshouse. I really did not feel that it explored either the "paradoxes relating to the interplay of global and local forces upon the communities and places of Glasgow" or the "heterotopic space containing its own oppositions; interior and exterior, nature and culture, global and local." Equally disappointing was Lauren Gault and Sarah Rose's "Sequins" floating in the Forth and Clyde Canal, resembling little more than the other detritus floating nearby. One exhibition where it was productive to read the accompanying blurb was in the Briggait, where Montreal-based artist Nadia Myre had riffed on the once upon a time sizable Glasgow industry of clay tobacco pipe production. With old pipe stems fashioned into various other items it raised questions about colonialism and waste and was a rare instance of concept and execution coming together to create something memorable. Ciara Phillips's prints in Glasgow Print Studio were beautifully presented and fascinating to see, and also worth seeing were the sculptural creations of Kapwani Kiwanga at Tramway, lumps of granite suspended on curtains of fabric. Next door in the main hall at Tramway Mark Leckey had a solitary carved figure, a blown up version of an 18th century figurine, facing off against a video of his cavities being explored, all perfectly entertaining once your eyes had adjusted to the gloom. Two highlights for me were the photography on show at the Hunterian Art Gallery at Glasgow University and that on show at SWG3. German photographer and film-maker Ulrike Ottinger has an extensive exhibition of bizarre and unsettling photographs, evoking cabaret acts and freak shows, on show alongside some of her films at the Hunterian. At SWG3 Hugo Scott's street photographs are full of humour and interesting characters, each one a short story. Also worth seeing at SWG3 were the sculpture in the main hall from Richard Wentworth and Victoria Miguel, and across the lane the creations and collages of punk designer Judy Blame. The Gallery of Modern Art has a jumble of interesting ideas and images, nine artists collectively displayed under the name Cellular World, but it all feels rather disjointed. If you rummage about in the main hall there are some interesting bits and pieces among all the clutter, Joseph Buckley's concrete wall I found the most engaging. Finishing off my day at The Common Guild felt like a gentle palate cleanser after the barrage of stuff earlier in the day. A solo exhibition by German artist Katinka Bock, a collection of small, quiet, clay and, slowly oxidising, bronze sculptures. There are two weeks to go, and at times it is a bit hard to sift out the wheat from the chaff, but there is surely something there for all tastes. Just keep looking.